In February 2010, in what was regarded as a landmark statement on Britain’s historic treatment of impoverished children and their families, the then-Prime Minister Gordon Brown delivered a public apology for the UK’s role in the widespread practice of emigrating impoverished children to former colonies during the early decades of the twentieth century. Between 1920 and 1960, some 130,000 children were sent abroad to countries including Canada and Australia as part of emigration ‘schemes’ organised both through state-sponsored and charitable organisations, purportedly for their welfare. Many child migrants experienced physical, mental, and sexual abuse, and were exploited for their labour. These ‘Home’ children were also frequently told that they no longer had living relatives in the UK. It would be many decades until their stories were told. In 1986, their plight and the scale of the practice was famously brought to light by Nottinghamshire social worker Margaret Humphries CBE. Humphries had received a letter from a woman searching for her lost relatives after being shipped to Australia at the age of 4 (a discovery later immortalized in the 1994 film Oranges and Sunshine) and began investigating, encountering similar tales from tens of thousands more survivors in the process. Humphries went on to found the Child Migrants Trust, a charity that campaigns to reunite former child migrants and their relatives, and to seek compensation for the abuses they suffered. Yet child emigration did not just appear out of nowhere in the 1920s. In fact, many more children had had these experiences for decades beforehand, particularly from the 1870s. This date was not coincidental. Transportation legally ceased as a criminal punishment in 1857, and the last convict ships set sail a decade later. The children sent under the new emigration schemes would previously have been viewed as likely to slide into a life of crime, given their poverty and status as juvenile delinquents in many of the reformatories they were sent abroad from. One form of transportation effectively replaced another. Historians are still uncovering fresh accounts of these children’s lives. Our team on this project is interdisciplinary, drawing together scholars with expertise in histories of poverty and urban space in the North West, crime, humanitarianism, and family law. We want to understand more about the local conditions that generated support for emigration and the legal framework in which emigration was condoned and financed by the governments of the day. The reciprocal benefits of emigration included a fresh injection of labour for Canada, a country struggling with an agricultural crisis, and less pressure on public funds to support the poor in Britain. The North West constituted a nexus of institutional, charitable and reformatory organisations that dealt with the severe and challenging problems of impoverished, orphaned and ‘deviant’ children. 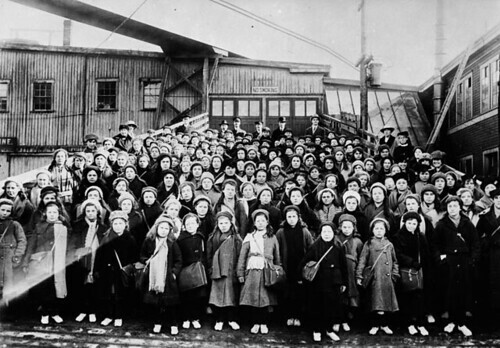 Liverpool emerged as the focus of child emigration, partly due to its status as a port and its important passenger trade to North America from which many emigrant children, including those from London, departed. Liverpool’s proximity to a number of large towns and cities that faced numerous welfare challenges, particularly Manchester, also encouraged its special role in the emigration system. Yet Liverpool faced particularly acute problems as the influx of Irish migrants, who were often extremely poor or destitute, put extreme pressures on the city and so the problem of destitute children fell on local Catholic Church. Indeed, the policy of child emigration was innovated by Father Nugent, who claimed there were as many as 23,000 impoverished Catholic children living on the streets dock area of Liverpool in the 1860s. Our regional approach aims to nuance historical understandings of the processes of emigration that to date have concentrated on London-based emigrating institutions such as Barnardo’s. Exploring the journey of the ‘friendless’ child from Manchester and Liverpool uncovers important debates regarding consent, control and citizenship in Britain during the late nineteenth and early-twentieth centuries. Our criminals are bred in our streets …an over-scrupulous regard for parental rights makes English lawgivers hesitate to act. …In some cases boys who have come to us have been claimed by their parents, and have been forced by them, to our great regret, and, in spite of themselves, to return to the miserable life of a street arab. These miscalled parents have led their children away from comfort, in order that they might obtain a few pence from their miserable earnings, regardless of the desire of their children to better themselves, and caring not that their offspring, by such a career, must assuredly develop into the corner-men of our City – a disgrace to our civilization and themselves. This is a difficult and, to modern eyes, uncomfortable perspective on the rationale for a system now overwhelmingly identified with sexual abuse. Yet by interrogating this justification for emigration and the narratives of ‘welfarism’ attached to it, we can gain a stronger sense of why emigration schemes were so popular across the United Kingdom and endured over the nineteenth- and twentieth century. Even as the concept of childhood as a discrete life stage came into existence (with the introduction of Education Acts of 1870 and 1880 legislating for children to have a compulsory period of schooling, and the age of consent being raised to 16 in 1885), and the bearing of the parent-child relationship on child development slowly began to be understood through the emerging discipline of Psychology, many still viewed total separation of children from ‘problem’ families as the preferred solution. Children themselves also found ways to adapt to their new lives away from their families. As our article shows, emigrating institutions were not unanimously devoid of concern for the emotional well-being of their charges. Children also forged close bonds of friendship and love with other children in their cohort as a means of survival. They sometimes found ways to display their resistance to emigration, writing letters home that continued to ask after long lost family members and expressed a desire to be reunited with siblings, even as they tried to make the best of the new situations they were given in Canada. Some children bravely reported the abuse they suffered, and were consequently moved out of those homes to a new placement by the emigrating society. For example, a document from the Nugent Care collection records the visit of a Chaplain from the Salford branch of the Catholic Protection and Rescue Society to Mary Judge in 1890. It reports that Mary’s first ‘placement’, with a Madame Waters in Montreal, had been terminated due to the ‘unkind’ treatment Mary had received — which included beatings and the sadistic refusal of Waters to supply the child with gloves during the freezing Canadian winter. The Society had consequently moved Mary to the residence of a postmaster in St. Hubert where she liked her work better, but told them ‘you know [Friar] I am still English and I like England,’ and subsequently it was noted ‘Mary wants her sisters of 15 and 17 years of age to come next May.’ Mary’s final comment on her abusive first home — ‘Mary said she did deserve some correction, but not as much as she received’ — poignantly suggests that she had already been institutionalised into expecting that her behaviour would be regarded as ‘deserving’ of punishment or ‘correction,’ perhaps a legacy of her experiences at Chorlton workhouse, from whence she was emigrated. By continuing to isolate Mary from her origins, the Society were administering the supposed moral ‘rescue’ from her deleterious environment and family connections that their name implied, yet the contentious question of her own agency in this process, or that of her family, remained tangible. Mary’s refusal to characterise her life in Canada in wholly praiseworthy terms, her stated identification with England and desire to be reunited with her family, and the fact that these feelings survived within the report suggests that children’s consent and wellbeing factored into consideration, and occasionally were empowered to offer a disruptive voice to institutional narratives of ‘rescue’. Moving forward, it is this more complicated relationship between the different actors involved in child emigration that we will continue to explore. In what ways has the legacy of child emigration remained in modern legal and social work practices today? In addressing the complex relationship between the state, charitable emigration institutions, and the experience of the emigrant child, our project offers new insights on issues around child protection and welfare. By drawing attention to the emigrant child’s voice, in particular, we hope to recover experiences and perspectives that help us to interpret what remains a controversial approach to child welfare in Britain. Research into child migrants provides insights into the challenges of identifying and effectively securing the welfare of the child, challenges which remain central to work with children in the modern world. Joyce Parr, Labouring Children: British immigrant apprentices to Canada, 1869-1924 (Toronto, 1980) p. 70. Liverpool Hope University Archives, NCA/005 Box 2, Fourth Annual Reports of the Homes for Catholic Friendless Youths (1894-1895), 4. Liverpool Records Office: 364 NUG 14/9. Entry 60, ‘Mary Judge,’ Shipping Lists August and September 1890.